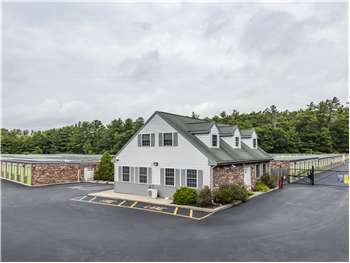 Located at the corner of Independence Rd and Summer St, Extra Space Storage serves residents of Kingston and Duxbury. Locals will recognize our facility a few minutes north of McDonald's and CVS. Extra Space Storage on Independence Rd offers a wide selection of storage units, drive-up access, and exceptional security. We're the storage solution you can trust in Kingston! Units at our Kingston storage facility are available as small as 5x5 and as large as 10x30 with features like first-floor access, drive-up access, and more. No matter what you need to store, we have the space for you! You can rest assured that your valuable belongings are protected at Extra Space Storage! We utilize security features like electronic gate access, an on-site resident manager, and 24-hour video surveillance. If you want the ultimate storage convenience, we highly recommend a storage unit with drive-up access. This amenity makes it easy for you to move items in and out of your unit by simply pulling a vehicle right up for unloading and loading. Drive-up units come in sizes 5x5 to 10x30. When you choose Extra Space Storage, you can expect nothing but the best! Not only do we maintain a clean, secure facility, but we also have a friendly, professional staff dedicated to providing exceptional service. Contact us today to reserve a storage unit in Kingston! People at the Kingston location were very helpful and the facility was very clean and easy to access. Would recommend. Very clean, secure facility. Jim the manager was extremely helpful and courteous, he explained every detail and answered all my questions. I highly recommend Extra Space Storage in Kingston MA! Having the security eases your mind that your belongs are cared for and safe. Having 24 hour access is a bonus. The customer service in Kingston was excellent! Steve at the front desk in Kingston did an awesome job of helping us think this whole process through, making our choice to use this facility easy. We researched a few others in our area but his professionalism and courtesy, as well as his obvious pride in this facility gave us the confidence we needed to make the final decision. Two thumbs up for extra space employees and the experience of professional help and honest service. Very easy to rent a space for my household goods. Unit is clean and easy to access. Facility location was quite convenient. only problem i have is the BS insurance that you are forced to buy !!!!! Everyone is extremely helpful. The location is very convenient as I begin to stage my home for an eventual sale and move to a neighboring community. Very easy, clear steps when setting up an account. This is my first rental and it was quite smooth. I like this storage facility because it is clean, the help is extremely friendly and courteous and no hassle. Extra Space in Kingston, MA is very clean and well maintained. The owner and staff are very friendly and accommodating. I have been using this facility for years and I have always been treated right. The staff is friendly and helpful. I would recommend this place to anyone in need of stoarage. The location is convenient and the staff was very helpful. I would recommend using this facility. Customer Service was great at the Kingston MA facility. The staff was very helpful and I was able to get in and out rather quickly. Steve was terrific, he was a huge help to me. He helped me decide which unit was bet suited to my needs. Drive southeast on Summer St. Take a slight right onto Kingstown Way. Continue straight on Kingstown Way at the roundabout. Turn right onto Independence Rd. Our facility will be immediately on the right. Drive northwest on Main St. Continue onto Summer St. Pass Duxbury Way and continue on Summer St. Turn left onto Independence Rd. Our facility will be immediately on the right. Drive southwest on Tremont St. Pass Pilgrims Hwy and turn right onto Summer St. Turn left onto Independence Rd. Our facility will be immediately on the right. Drive east on Pembroke St. Turn left onto Winter St. Take the 1st exit at the roundabout onto Kingstown Way. Turn right onto Independence Rd. Our facility will be immediately on the right.